​DisplayMate reported on the iPhone X and called it the best smartphone display ever, a judgment it gave previously to the Galaxy S8 and then the Note 8. We looked for differences between the displays and found that the Note 8 has higher resolution and higher pixel density. 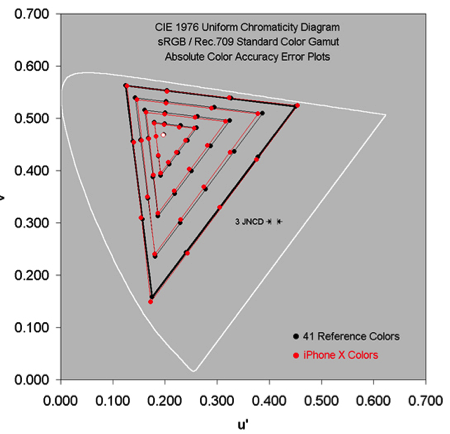 The Note 8 has effectively 3 color gamut settings, while the iPhone X has 2 and Apple has implemented Color Management in order to get the second smaller sRGB / Rec.709 Gamut to also appear correctly, which is generated from the wider native DCI-P3. Each iPhone X display is individually calibrated at the factory for both color and contrast accuracy. The differences are primarily in screen brightness and color accuracy.. From a brightness perception, the iPhone X display has higher homescreen brightness, average brightness and full brightness, but lower peak brightness as shown in the next table. In terms of low ambient light conditions, the displays are equal and in the important high ambient light conditions, (when the Note 8’s auto brightness is engaged, iPhone X has higher CR at the low end but lower CR at the high end. Screen readability is viewed to be equal. 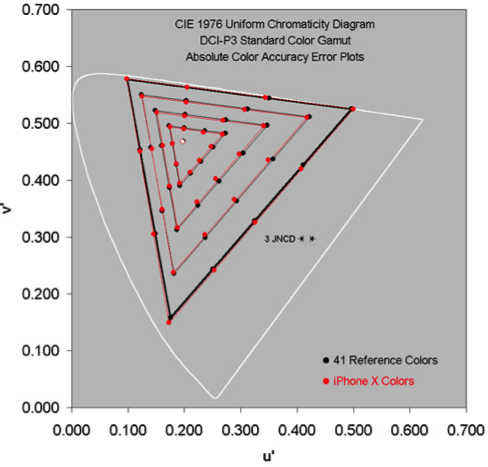 The Absolute Color Accuracy of the iPhone X was judged to be Truly Impressive as shown in the figures below. 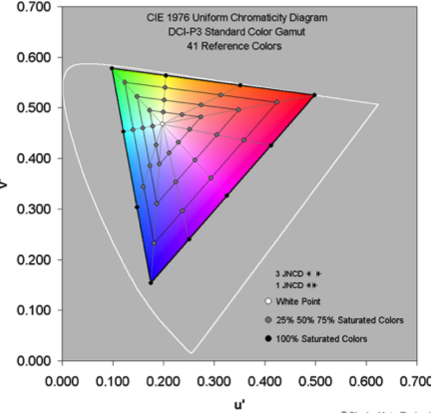 It has an Absolute Color Accuracy of 1.0 JNCD for the sRGB / Red.709 Color Gamut that is used for most current consumer content, and 0.9 JNCD for the Wider DCI-P3 Color Gamut that is used for 4K UHD TVs and Digital Cinema. It is the most color accurate display that we have ever measured. It is Visually Indistinguishable From Perfect, and is very likely considerably better than any mobile display, monitor, TV or UHD TV available on the consumer market..